crafting with katie: Thank You Emma - Surprise Birthday Hop! 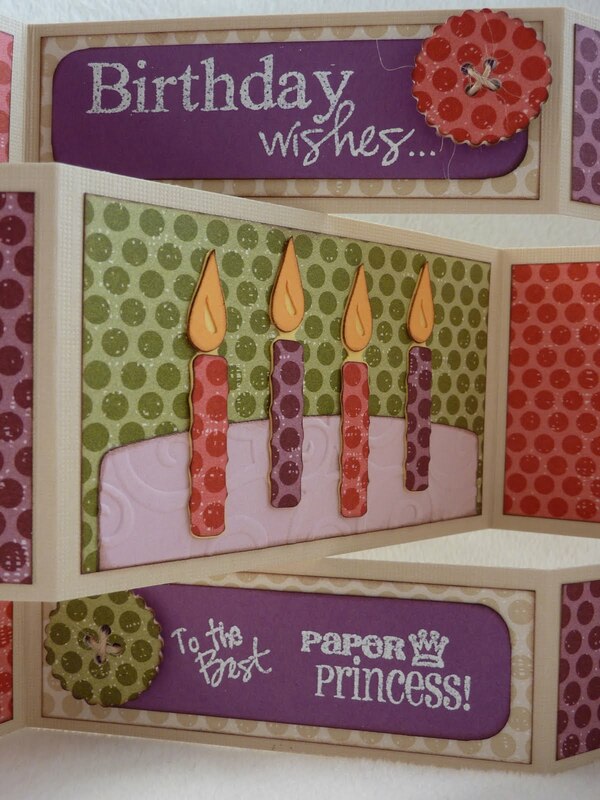 Happy, happy birthday, Emma Aguilar, the original "Paper Princess"! Today the first My Creative Time Design Team is having this blog hop to thank Emma for giving us the opportunity to be on her design team AND to wish her the happiest of birthdays! Emma, you are a dream to work with. I LOVE your stamps and all of the fun we have together! Wishing you a year of happiness, GOOD HEALTH, and big things to come! Now, on to the card. This is a tri-shutter card. I first learned how create one of these by watching a video by Mary on Cardz TV. If you want to make one, I recommend checking out her video here. You start with a 5 1/2" x 12" sheet of cardstock, and with all of the scoring and folding, it ends up to be 5 1/2" x 4" card when folded up. I had fun choosing my sentiments. I used three of Emma's stamp sets! 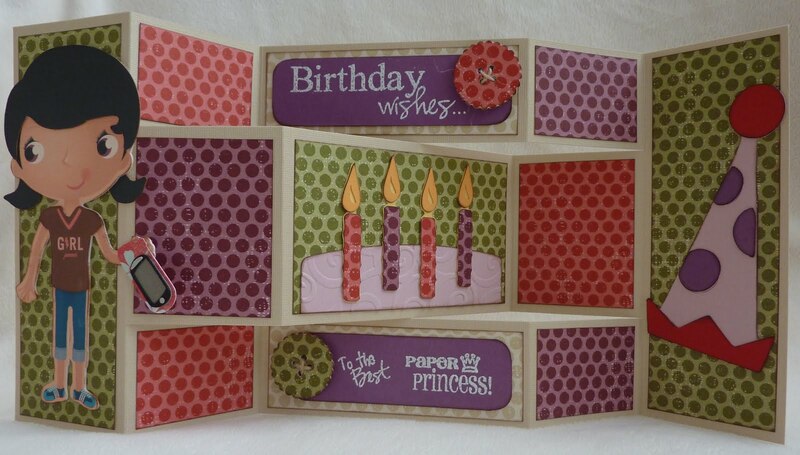 "Birthday wishes" is from Polka Dot "SURPRISE", "To the Best" is from My Teacher Rocks!, and "Paper Princess" is from Paper Princess! Click here for ordering information on all of Emma's stamp sets. I embossed all of these with white embossing powder, and I added buttons made with Papertrey Ink dies, coasters (to make them thicker), and patterned paper. My "birthday cake" is cut at 4 1/2" from the Wrap it Up cartridge, trimmed down to fit my space, and the candles (also from this cartridge) are cut at 2". I cut the party hat at 3 3/4" from the Birthday Bash cartridge. Last, but not least, is my mini-Emma. She is printed and cut from the Best Friends Imagine cartridge at 4.8". I used layers from 3 different girls to get her look. Emma's Gypsy is cut at 1/2" from the Cricut Everyday cartridge. Time to keep hopping! If you got here in the middle of the hop, be sure to head back to the beginning (see the line-up below). Otherwise, your next stop is our super talented Glora! How sweet of you girls! Your card is so super cute, Katie. Emma is going to LOVE it, for sure! Ohh Katie this card is beautiful as always! I have to give this style of card a try! Love it! I love it! 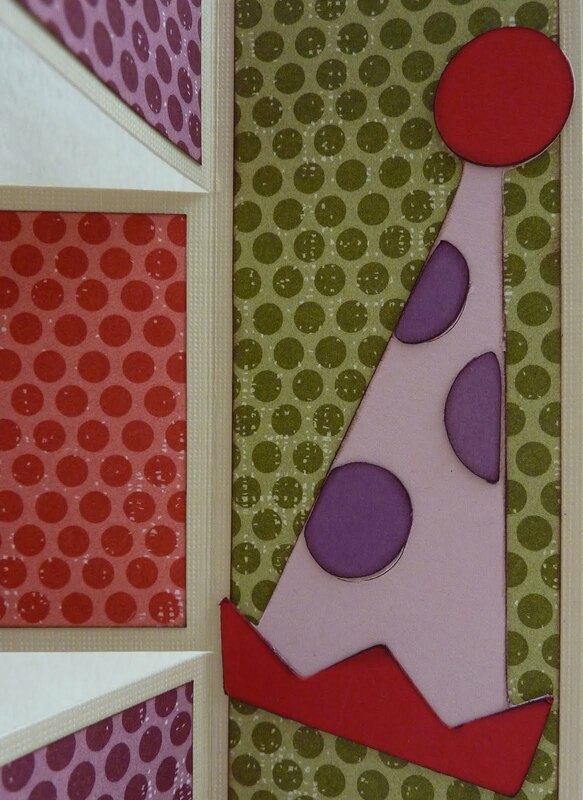 I really would love to learn how to make a card like this! This is so cute! I love the polka dots!!! Simply Adorable Katie. I love this card. oh my goodness katie, this is so stinkin' cute! This is just too adorable!!!!! Wow!!! Awesome card!! it just screams EMMA!!! What a fantastic card!! The bright colors and polka dots are perfect for Emma! I love the girl and the card is FABULOUS - I really need to make a card like that. OMGosh! This is so cute!! It is just awesome! And Emma will love it for sure! Wow, that is a beautiful card. I need to learn how to do that. This is sooo cute! Very awesome card and so perfect for Emma! what a wonderful card! good job! What a great card. You must have used up your polka dot stash to make this and I can't believe you could make a cut so small as the Gypsy buttons. Very cool card. Thank you for sharing in the hop and helping make Emma's Birthday extra special. amazing - i love the detail! I love the tri-shutter card. I've never attempted one, but it would be worth a go. This is such a gorgeous card! I love all the sentiments all embossed in white and that cute, cute Emma! You are so talented, Katie! GORGEOUS!!! I love the bright colors and polka dots! The sentiments are perfect! Mini Emma accessorized with her Gypsy is adorable! Thanks for sharing! Tri-fold cards are one of my favorite types of card and this card is amazing. I love the colors and the paper you chose. So fun! TFS. Great polka dot shutter card. waooo EMma is going to love this card... I do..
What a fun and adorable card. This is an amazing card!!! Wow!!! So fantastic with so many awesome little details! Love mini Emma with her gypsy!!! Thanks for sharing! That card is so adorable!! I just love that it's tri-shutter. You really out did yourself on this one. The details are wonderful, it really does look a bit like Emma, especially with that adorable little "Gypsy Girl" as she would say. This card is so beautiful. Thanks for sharing. Love the card. I'm your newest follower and I love your card, super cute!!! Love the card design. Very cool, and the colors are great! Thanks for sharing. Your birthday card is absolutely adorable!!!! So cute. I wish they had released the cricut everyday cartridge for everyone. Thanks for sharing. Super cute card!!! I love the stamps and the Girl!! Too Cute!! TFS!! Take Care!! I love all the details on it. Super cute card! I love making tri-fold cards. Love all the polka dots and the girl with her "Gypsy Girl"! Thanks for celebrating Emma! Love the card! We all know Emma loves her Polka Dots! Cute card! I love the color combo that you've used! How sweet of you all to do this for Emma! HB Emma! What a beautiful Tri-shutter! Gorgeous! This card has Emma written all over it! SO CUTE! Wow...your card is amazing! I will definitly be checking out the how-to video. TFS! Your shutter card is adorable!! Wow, just awesome! I LOVE YOUR TRI-FOLD CARD!!! I know I left a comment... stupid blogger. I LOVE this card too! It is so Emma! I LOVE that paper and that fold! Oh Katie you always inspire me! I am sure she loved this card!